I usually focus on folks who've been using Microsoft Windows for a while and enjoy learning about new tricks, like tips for using the middle mouse button effectively or free downloads for tweaking Windows 7. But it recently occurred to me... what about readers who are new to Windows? This week I'll cover some basics for those who are just getting started. If you don't need these tips yourself, maybe they'll help a friend or coworker. See these four icons, the ones in the red box? You've probably seen them a thousand times. They appear in the Open and Save boxes for countless programs, right alongside the Look In field that designates where on your PC you're going to open or save something. From left to right, the icons function as follows. Go To Last Folder Visited: If you've been hopping around from one folder to another, clicking this takes you back to the folder you viewed most recently. This icon will appear grayed out if you haven't yet switched to a different folder. Create New Folder: This creates a new folder--a subfolder, really--within the current folder. Upon clicking, you'll need to type a name for the new folder. Press Enter when you're done. View Menu: Clicking this produces a drop-down menu with various choices for how you want to view the various files and folders you're seeing. I'm not going to explain them here--your best bet is to experiment and see which view you like best. Don't worry: You're not rearranging anything, only changing the presentation. I regularly encounter people who don't know the difference between a file and a folder. That makes for a bit of confusion when someone tells me, "I just downloaded some photos, but I can't find the file they're in." Uh, what? Actually, what you mean is you can't find the folder they're in. This may seem like a minor distinction, and obvious to anyone with intermediate-or-better computer skills, but it's important. You can't get help with a problem if you don't know the proper terminology. Let's start with files. A file is any individual item on your PC, be it a photo, a Word document, a Quicken database, or an e-mail attachment. A Zip file, which is commonly used for attachments, is a single compressed file that contains one or more other files. Pretty simple, right? Folders are containers for these files. 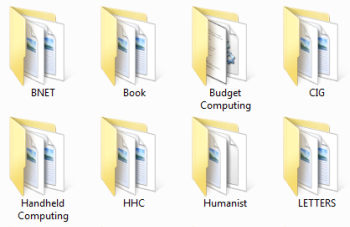 Windows starts you out with a handful of folders (Documents, Music, Pictures, etc.) you can use to store common file types, but as I explained earlier, it's easy to create new folders. Now let's tackle an area that typically confuses the heck out of Windows novices: single-clicking versus double-clicking. The reason this is so confusing is that there's very little rhyme or reason to it. Some functions require a single click (of the left mouse button, that is), others a double. Nowhere in Windows is it made obvious which is which. Rule #1: Don't double-click in a Web browser. Links, buttons, tabs, toolbar icons, and everything else you're likely to encounter in your browser require one click only. If you double-click, say, an e-mail address, you'll end up with two e-mail windows. Rule #2: Don't double-click the quick-launch program icons in your Windows taskbar (you know, the ones to the right of the Start button). Part of what makes these "quick" is that they require only one click. In fact, don't double-click anything in the taskbar. Rule #3: Do double-click program icons on your desktop (when you want to run those programs, natch) and files/folders you want to open. And that's it. You'll rarely ever need to double-click anything else in Windows. Let's look at a very common source of confusion for novice users: saving and retrieving file attachments. I routinely field calls from friends and family members who've saved a file received as an e-mail attachment, but now can't find that file. First things first: The first time you save a document, always use Save As, then navigate to the folder you want to use. See, when you open an e-mail attachment in, say, Word, it's actually loading from an obscure, impossible-to-find Windows temp folder. And that's where it'll end up if all you do is click Save when you're done. Next, pay attention to file names. And feel free to rename your document (which you can do after clicking Save As) to something you'll more easily recognize and remember later.